The beekeeping continues. I’m a little late in reporting on last weekend’s hive visit because I visited again today, Memorial Day. Today’s visit warrants its own story, so you’ll have to wait until tomorrow for that. In the meantime, let me tell you about last week’s visit. Laury and I double-teamed again and inspected my hive, then Laury’s hive. 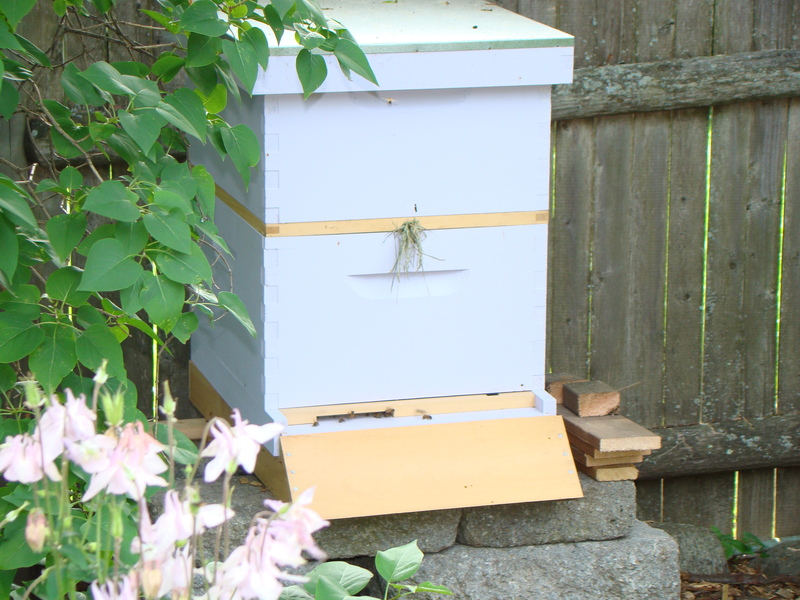 Being new at this, it’s wonderful to be able to see how the two hives progress and compare. The moral support is invaluable as well. Inside my hive, there was lots of capped brood, pollen, honey, and I saw my queen again. 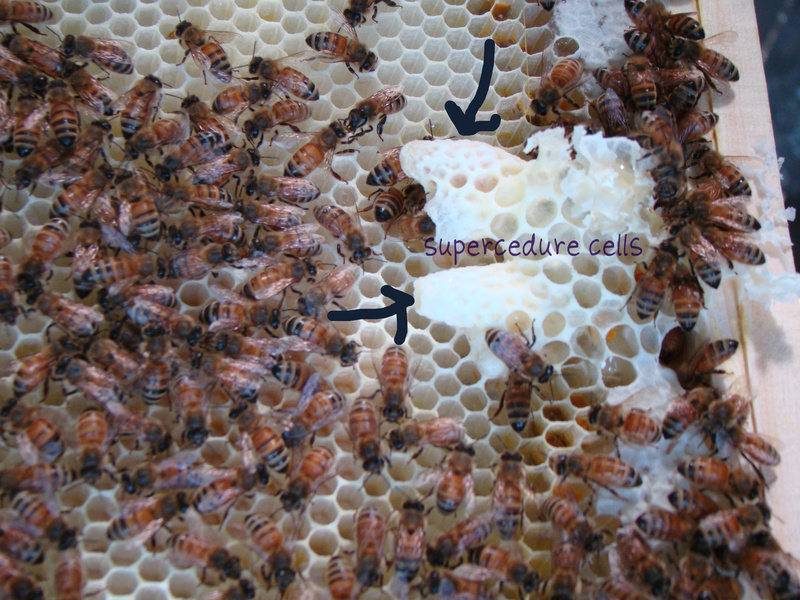 The only unexpected sight was a couple of supercedure cells. These mean the bees might be thinking about replacing their queen. I wasn’t sure what to do, but after consulting with Nancy, she said not to worry and just to remove these cells. She felt they were “just practicing”. I’m not sure what that meant, but that’s what I did. At Laury’s, everything looks great! 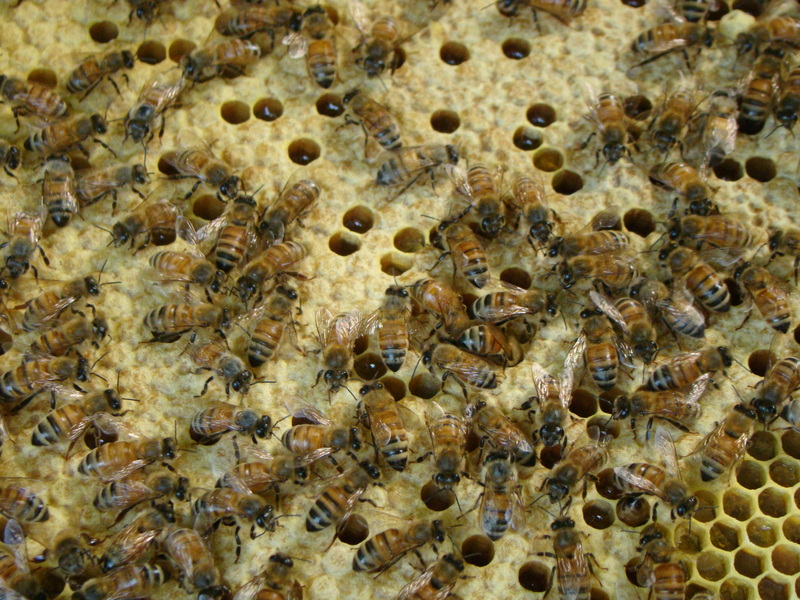 She also has plenty of capped brood, pollen and honey, though we haven’t seen her queen. Posted on 28 May 2012, in Bees and tagged bees. Bookmark the permalink. 2 Comments. I don’t understand – why do they want to replace their queen? Do they have a mutiny or something? How neat that you have some honey already!